We strongly recommend that parents and students select the IRS Data Retrieval option when filing the initial FAFSA or when subsequent corrections are made to your 2018-19 FAFSA application. This option will streamline and expedite the processing of your financial aid application. A federal tax return filed with the IRS. Federal Student Aid ID (FSA ID) that you can apply for during the FAFSA process. An unchanged marital status since December 31, 2016. 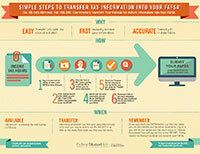 An infographic to help you get tax info into your FASFA.